This page describes all the features and parameters supported by the Chart API. Some of these parameters behave differently depending on the chart type; when that is the case, the documentation links to the appropriate chart documentation. These are the parameters supported by the Google Chart API. All charts require the size to be specified. This parameter determines the total width and height of the chart image, including legends, margins, and titles. Legends, margins, and titles are clipped to fit within the total chart size. Maximum chart size for all charts except maps is 300,000 pixels total, and maximum width or length is 1,000 pixels. Maximum size for maps is 440x220. Width, in pixels. Maximum value is 1,000. Width x height cannot exceed 300,000. Height, in pixels. Maximum value is 1,000. Width x height cannot exceed 300,000. A 250 pixel x 100 pixel chart. Specify the chart type using the cht parameter. See the individual chart documentation pages for a list of available chart types. One of the chart type values. [Optional, line charts only] You can add :nda after the chart type in line charts to hide the default axes. A line chart with and without default axes. You can specify the colors of a specific series, or all elements of a series, using the chco parameter. The exact syntax and meaning can vary by chart type; see your specific chart type for details. Each entry in this string is an RRGGBB format hexadecimal number. Colors that apply to a whole series are delimited by a comma, colors that apply to individual elements within a series are delimited by a bar. For most chart types, you can mix color descriptions for whole series and individual series elements. If there are more series or elements in the chart than colors specified in your string, the API typically cycles through element colors from the start of that series (for elements) or for series colors from the start of the series list. Again, see your individual chart documentation for details. When you specify a single color for each series in a line chart, each line is assigned the corresponding color. This example has three data series and three colors specified. This line chart also has three data series, but only two colors are specified. Because the color for the third series is unspecified, the third line is drawn using the first color (red). This example demonstrates how to specify a color for individual members of a series (bars in this example). This demonstrates specifying both series colors and individual element colors. The first series is all in black (000000). The second series, marked off by a comma, has individual colors assigned, delimited by | characters. You can choose the output format of your chart using the chof parameter. This parameter can also be used to display debugging information when designing your chart. Note that some output formats are graphcal (for example, PNG and GIF) but others are not. Using a non-graphical format as the src parameter of an <img> tag will cause a broken image on your page. 'png' - Returns the chart as a PNG image. 'gif' - Returns the chart as a GIF image. 'json' - Returns image map data for the chart, as a JSON string. 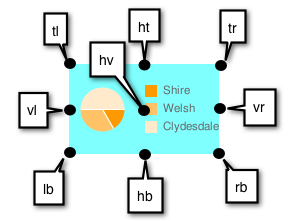 This can be used to generate an image map for the chart to make various regions clickable. See Creating a Chart Image Map for the format of this string and more information about how to use it. 'validate' - Returns an HTML page listing any errors in the chart URL. See Debugging for more debugging tips. Specifying chof=validate returns an HTML page; here we've made it the source of an <iframe> so you can see the results page. Here's the HTML returned for a valid url when chof=validate. Candlestick markers indicate variance and direction change in a data series. Often they are used to show stock values during the course of a day. The marker includes segments that show the high and low value, as well as the opening and closing value for a specific time period (typically a day). For more about candlestick markers, see here. Series 1 and 4 specify the bottom and top of the vertical line, respectively. These typically represent the low and high values for the day. Series 2 and 3 specify the vertical borders of the rectangle. Series 2 is the opening value, and series 3 is the closing value. The color of the rectangle depends on which is higher: when the opening value (series 2) is lower than the closing value (series 3), the price has increased, and the rectangle is filled with solid green by default; when the opening value (series 2) is higher than the closing value (series 3), the price has decreased, and the rectangle is filled with solid red by default. You can only specify a fill color for the rectangle with decreasing value. When you specify that, the rectangle with increasing value is unfilled (empty). Note that series 2 can be either the top or the bottom of the rectangle, depending on whether the price has gone up or down. You can combine candlestick markers with any other chm parameters using a pipe character ( | ) to separate the chm parameters. Note: If you do not want the lines for the data used to draw the markers to appear in the chart, you must include a 0 after the format type. For example: chd=t0:10,20,30,40 in a text format data string. See Compound Charts for more information. Indicates that this is a candlestick marker. [Optional] Fill color for the rectangles when the value is decreasing (when series 2 value > corresponding series 3 value). This is an RRGGBB format hexadecimal number. When the values increase, the rectangle will be empty. Default is solid green for increasing, solid red for decreasing (you cannot specify a custom fill color for increasing values). The index of the data series to use as the first series for your candlestick markers. This is a zero-based index. So, if you specify 1 here, and you have six series, the second, third, fourth and fifth will be used to draw candlestick markers. n.d - Draw a marker on a single point in the series, where n.d is the index of the point in the series. If you specify a non-integer value, then the fraction indicates a calculated intermediate point. For example, 3.5 means halfway between point 3 and point 4. -1 - Draw a marker on all data points. You can also leave this parameter empty to draw on all markers. The width of all rectangles, in pixels. Here's an example of candlestick markers on a line chart with four series. The custom fill color 0000FF (blue) is specified, and this color is used to fill the rectangles when the point in series 3 is smaller than the equivalent point in series 2. The first and last rectangle are trimmed by the chart. To eliminate these values, you could specify 1:4 for the fourth parameter of chm. Note the zero in the data string, to hide the lines for the series: chd=t0. This indicates that all chart data is to be used for markers. The <which_point> parameter is blank, which draws candlesticks on all data points. Here's an example of the same chart, using the default colors, and removing the first and last item. This is a compound chart: it is a combination of a line chart (the base chart type) and candlestick markers. The value of 1 in cht=t:1 means that all data series after the first should be hidden from the basic chart type (line chart). The first 1 in chm=F,,1,1:4,20 means that the candlestick data comes from series 2, 3, 4, and 5 (the 1 is zero-based). See Compound Charts for more information on how to draw a compound chart like this.